Well, summer is winding down. Though summer doesn't seem to realize that...it's been mid to upper 90's so far all this week. And today is not the exception. So yeah, summer is supposed to be winding down. But it's not going without a fight. I prefer to believe that that's because it hasn't seen enough popsicles yet! I can hardly argue with that. Yes, today is Wednesday. And during this Summer of the Popsicle, Wednesday has meant that a guest-popsicler would be stopping by to share a tasty creation with us. And after 15 amazing weeks of even more amazing guests, I'm jumping in with a pop of my own! I decided to nestle myself...and these ice pops I've been sitting on all summer long (wouldn't that be a glorious mess)...into this Wednesday slot. Now, it's funny. 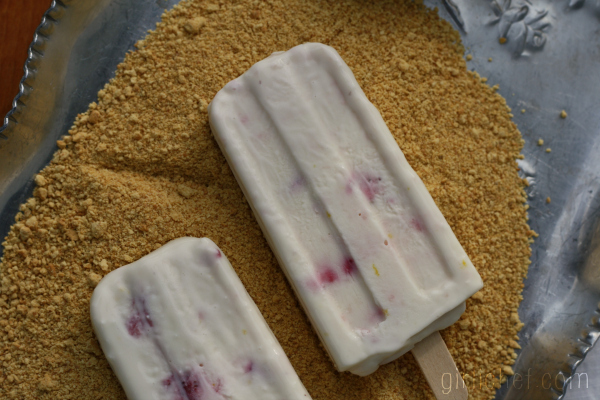 I've been testing out new ice pop, popsicle, and paleta recipes all summer long, but this is one I made way back towards the end of May. At the beginning of summer. And since then, I've noticed a trend. A CHEESECAKE POPS trend! Must be something in the air this year. 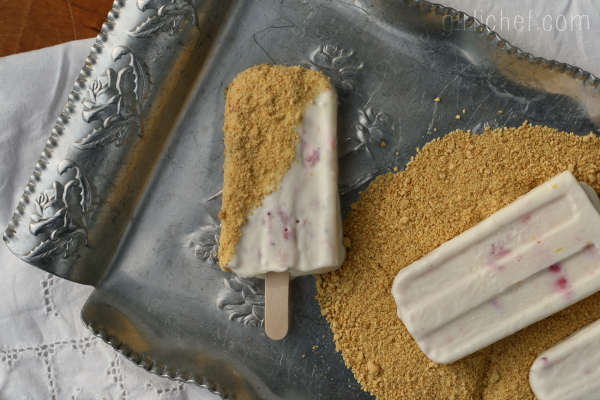 Three of my guest popsicles have shared cheesecake-inspired frozen pops. Even more people have linked some up to the Summer of the Popsicle. Obviously this many people can't be wrong! Initially I started out with a New York style cheesecake in mind, and sort of built up from there. I contemplated a thin sour cream layer on top of the cheesecake center, but didn't wind up using it. Logistically I'll figure out how to swing that next time, because I think it would be pretty cool. But that said, we all devoured these. Because yes, they were ridiculous! So cheesecakey. So creamy. So perfect. Mash the strawberries to a pulp, leaving a few small chunks. Set aside. Place the cream cheese, heavy cream, sweetened condensed milk, lemon zest and juice, and the salt in a large, deep bowl (to minimize the mess). Use a hand mixer to blend everything together until creamy and smooth. Start slow so that everything doesn't splatter all over the place. Very gently swirl the strawberries through the cream cheese mixture. Pour into popsicle molds. Freeze for at least 4 hours, or until firm - adding your popsicle sticks at the correct time for your mold. To serve, mound the graham cracker crumbs onto a plate. Remove the pops from their molds and allow to sit for a few minutes, just so that the outsides become tacky. 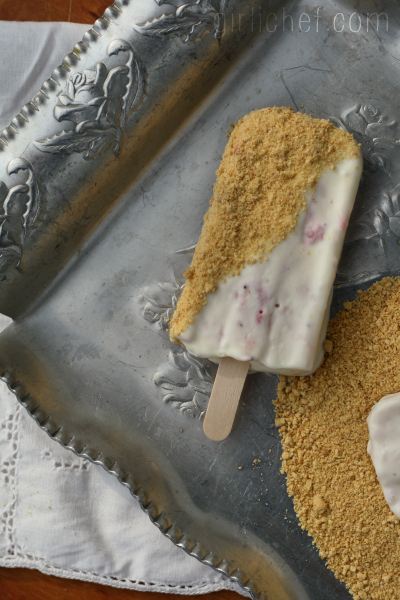 Dip the tacky pops into the crumbs, as many or as few as you like...the more, the better!